If you’re still waiting around to find an iPad 2 in stock, you might want to consider ordering online through the Apple Store. 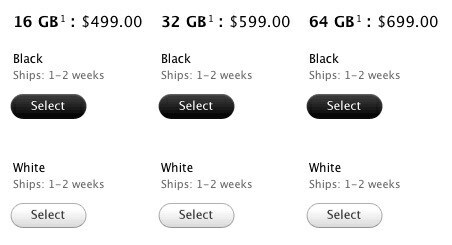 Online shipping estimates for iPad 2 have now dropped down to 1-2 weeks for all models, including both colors and all sizes in Wi-Fi only, 3G, and CDMA. This is a significant change from the 3 weeks that was reported just a few days ago, as it indicates supply is easing slightly against iPad demand that remains through the roof. If you’re impatient waiting a couple of weeks may seem like a long time, but as I continue to check availability of iPad 2 by calling around, I find that nearly all Apple Stores continue to sell out every morning. The only model that seems to stick around until the afternoon is the most expensive Verizon 64GB version, and by evening even that one is gone too. Sure, you can try finding one at Target or other resellers, but their supply continues to remain strained leaving the Apple Store to be the most reliable location to buy. It’s not just the USA that has reduced shipping times, MacRumors reports that shipments to Canada, Mexico, Australia, New Zealand, Finland, Sweden, UK, Germany, and the majority of Europe are also reported as 1-2 weeks from Apple’s online store. I have been trying for weeks to find one locally, I just gave up and bought it online. Ordered my ipad 2 April 20 after reading article of 1 to 2 weeks shipment and it was scheduled to ship May 4, when ordered from Apple. Shipment has been sitting in China ready to ship for two days. I wouldn’t count on anything less than 2 weeks.